Dressing of side tables and coffee tables with table top pots finishes the design. 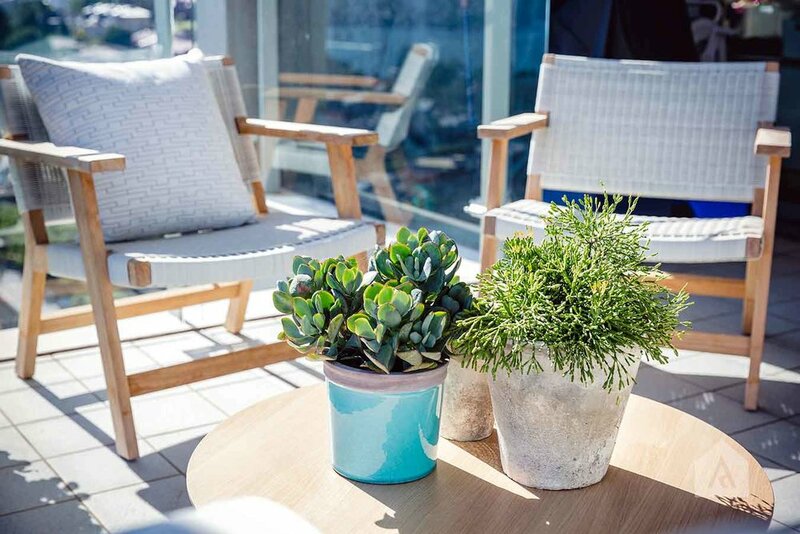 Pots on table help make the area feel cosy and decorated like an indoor lounge room with a vase of flowers. Mixing up the textures and colours of the pot gives a contemporary eclectic feel. Small table tops are a cost-effective way of changing the style of your space. Using flowering plants in spring and hardy cactus in summer. A selection of table top pots are available from our Danks street studio. 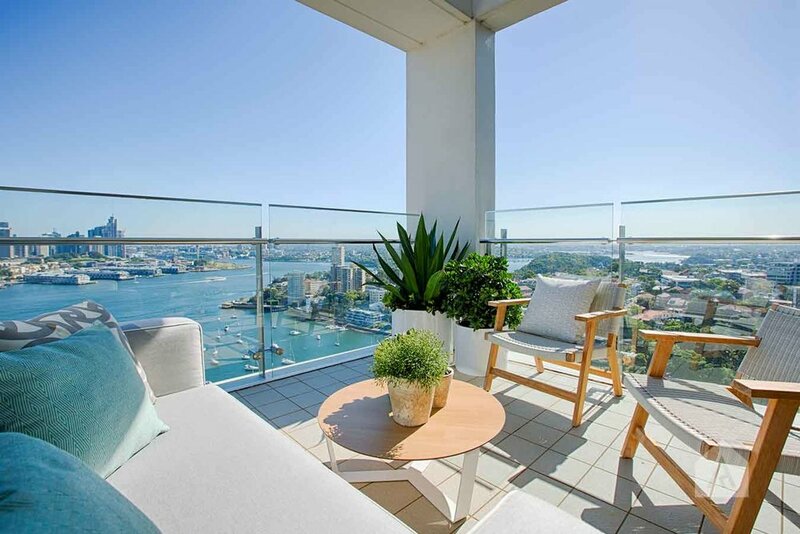 Scatter cushions in hues of blue and grey were used to bring in the colours of Sydney harbours deep blue water and the blue tones from the sky. Using throw cushions on the chairs is a great way of bringing a pop of colour to the exterior space. It makes the space again feel considered and inviting. Cushions are a in expensive way to change your outdoor area each season, using a different colour or texture in winter as to what you would in summer. The furniture pieces chosen were a twist on contemporary classic. Mixing a slim line modern lounge with a woven white chair in a classic shape. Using different occasional chairs to the lounge piece make the space feel warm and the design considered. The mixing of textures with furniture gives an interior feel, softening with throw cushions also helps with this. Coffee and side tables help to encourage guests to use the space. A place to rest your glass or feet is always inviting, again making the space relate to the interiors. 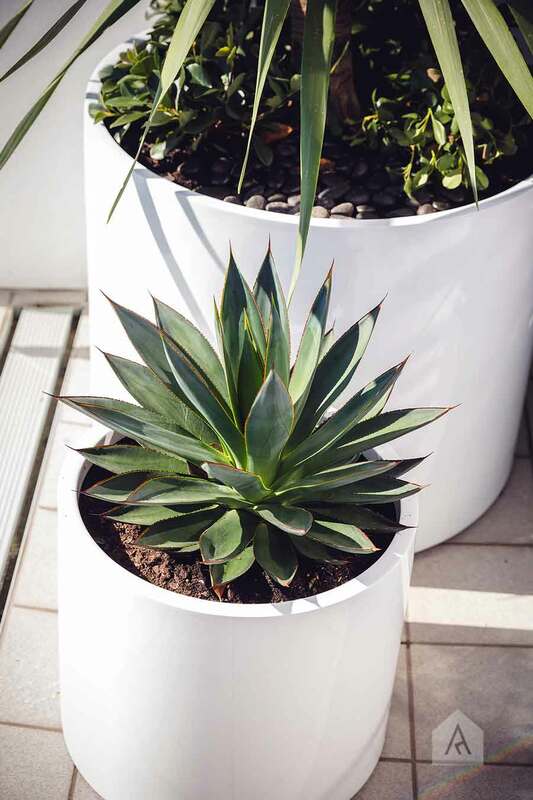 White cylinder planters were chosen at varying heights to blend in with the exterior. 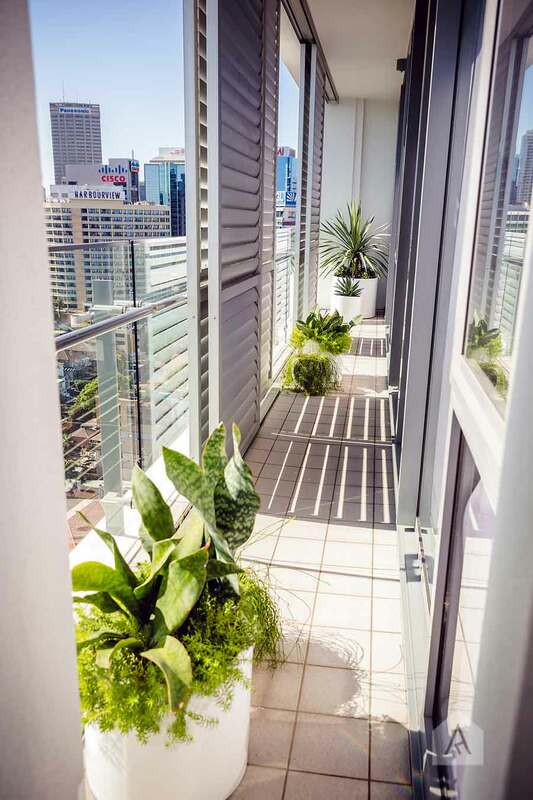 Adding green to the balcony without distracting from the views. Hardy specimen plants were chosen that could tolerate high winds, full sun and dry conditions. Under planting in most of the pots help to soften and create a lush full planting style whilst only using minimal pots.